have many megaphones to choose from. 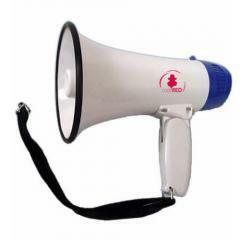 The CodeRED Loud Mouth Megaphone is an essential piece of equipment for emergency response, crowd control, event security and many other police, fire and medical applications. This powerful 8-Watt model provides enough amplification for a 300-yard range when used at maximum power. The volume control allows for rapid and variable adjustments to audio, especially when full blast is not necessary. An added siren alarm switch offers versatility and a means to getting immediate attention of a larger crowd. The megaphone's handle is easy to grip and folds away for more compact storage in vehicles or equipment bag. The megaphone also includes a convenient carrying strap for portability.